Marked here is her childhood home. She was the first American woman to receive a pilot's license. Harriet lived in this house as a child and attended the nearby school. 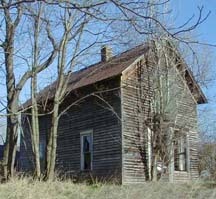 Her parents, William and Ursula Cook Quimby, settled in Bear Lake, present-day Arcadia Township, in 1867 and acquired this property in 1874. Ursula produced and sold patent medicines like "Quimby's Liver Invigorator," which was advertised in the Manistee Daily News. Between 1887 and 1890 Harriet and her parents moved to Arroyo Grande, California, which Harriet claimed as her birthplace during interviews later in her life. By 1900 the Quimby's were living in San Francisco where Harriet embarked on a career as a drama critic. Early aviatrix, Harriet Quimby, was inspired to learn to fly. She covered the October 1910 Belmont Park International Aviation Meet for LESLIE'S ILLUSTRATED WEEKLY newspaper in New York. She authored drama reviews, travel pieces, and eventually wrote about her own adventures as a pilot. On August 1, 1911, Quimby received the first aviation license granted to an American woman. With this success came immense popularity. On April 16, 1912, seeking additional recognition, she became the first woman to fly solo over the English Channel. Her achievement was overshadowed in the press however, by reports of the sinking of the Titanic. On July 1, 1912, Quimby and a passenger died when her plane plunged into Dorchester Bay at Squantum, Massachusetts. Papers and photographs collected by Arcadia resident, Mrs. Bonnie Hughes, in her quest to prove that Harriet spent her childhood years in our area are shown on three pages. We appreciate all her work. Looking at these primary source documents gives Onekama students a sense of local & world history. 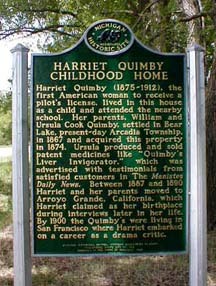 Harriet Quimby Historical Marker Dedication Ceremony was held on site May 25, 2000. Our Sixth Graders have written biographies of Harriet Quimby. Some have been uploaded to the Internet. Fifth Grade students created "Quimby HyperStudio Reports". They enjoyed using their programs to teach the younger students about Miss Quimby. Photographs of the house as it exists today can be viewed at this site. Cody Brandt created a Harriet Quimby Cancellation Stamp for the May 25 dedication at Arcadia. See it here. See also: Historic Arcadia Website The museum site offers more Harriet Quimby information. Since learning that Harriet Quimby's childhood home was located in our school district, Onekama Students have been busy learning about her. Our library has quite a few copies of the two books by Ed Hall. Many children chose to read the books. We also checked the web sites related to Miss Quimby and read articles. Sixth graders wrote biographies and fifth graders made HyperStudio presentations commemorating the life of Harriet Quimby. Arcadia third grade students made posters. Check these pages.